I have to make a confession. I buy bananas to sit on my counter. Not for them to spoil or to get rotten. The reason I do it so that the bananas will over-ripen and I can make banana bread. Don’t judge me. I love me some banana bread but what about banana cake? 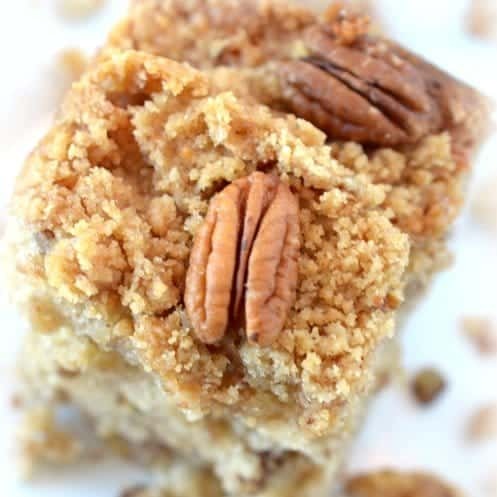 When I was looking at the bananas this morning, I wanted to do something different and that my friends is how this banana crumb cake came to be. As a bonus, it’s one of the more easy cakes to bake at home! 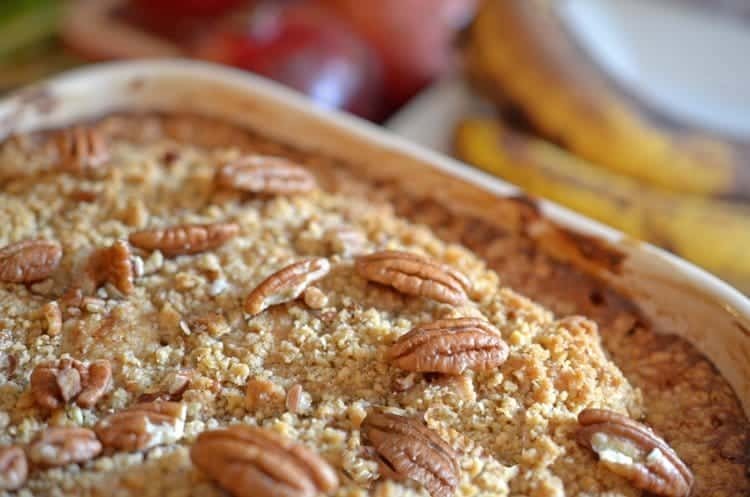 Bananas are good for more than just banana bread! Although we’ve made that a time or two as well. This banana crumb cake is a welcome change and you will fine it to be one of the more easy cakes to bake at home. With this banana crumb cake, you later crumbs, batter and more crumbs before baking. It’s one of the more easy cakes to bake! The house filled with the heavenly aroma of banana cake. I stood at the oven trying to will the cake to cook faster so that I could have a slice. Then I remembered the old adage that my mom instilled in me as a child, “Good things come to those who wait.” Thus, I patiently waited and continued to enjoy the warm and heavenly wafts coming out of the oven. When the banana cake finally cooled, we sat at the kitchen counter as a family and had a slice of this banana crumb cake. Not only was my mom right on target with her advice, this is one of the easy cakes to bake, based on my time as a kitchen dad. 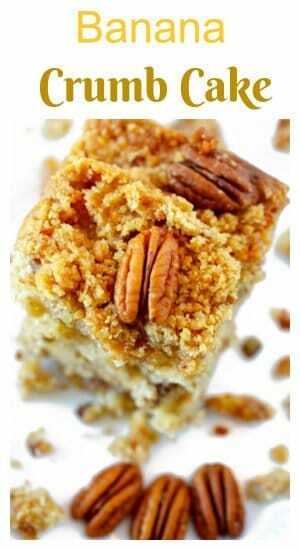 Try this banana crumb cake today! We discussed world events with the boys, which really only means things like school, skateboarding, snowman building, and important things like that. Oh, and this banana cake. 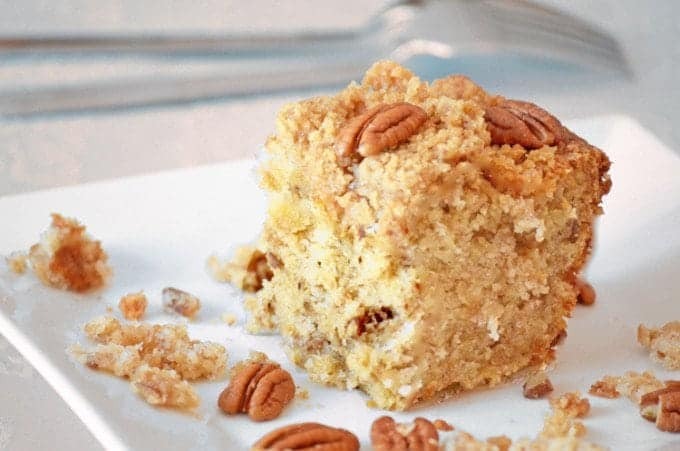 Savory pecans make a part of this double layer of crumbs that take this banana cake to the next level of taste. 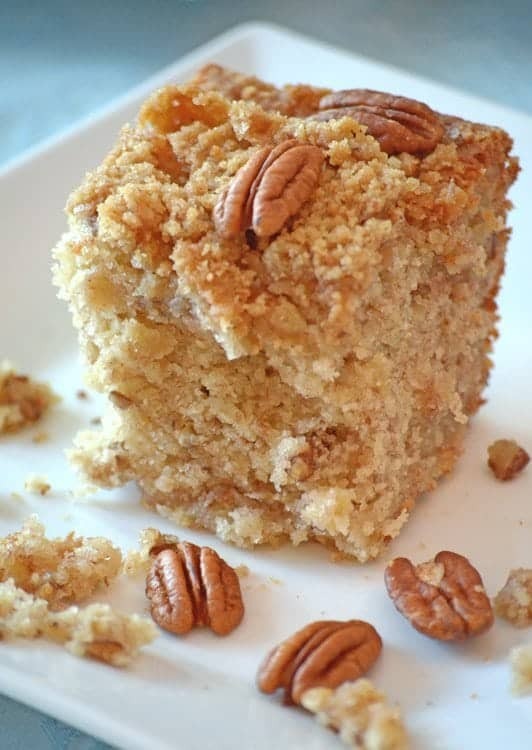 Take a break from banana bread and make this banana crumb cake instead! You'll find this is one of the easy cakes to bake at home, it's from Southern Plate. 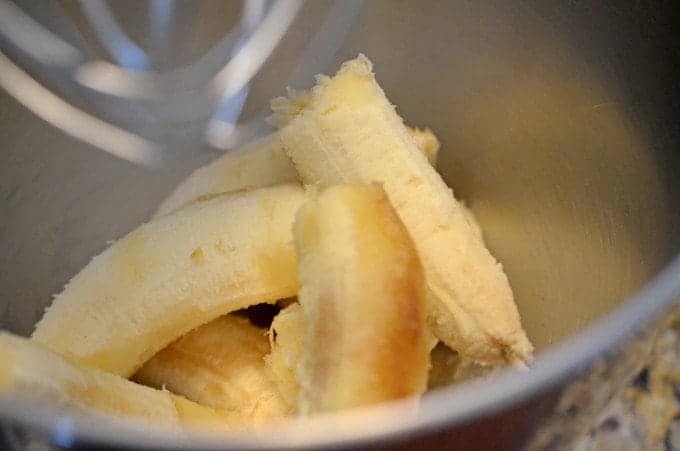 Make this banana cake today. In a bowl put the the soften butter, brown sugar, flour, pecans and cinnamon. Using the back of a fork, push the fork down on top of the ingredients to combine.Continue until the mixture forms into sandy consistency. Pour 1/2 of cake batter into the pan. Sprinkle 1/2 of crumble mixture on top. 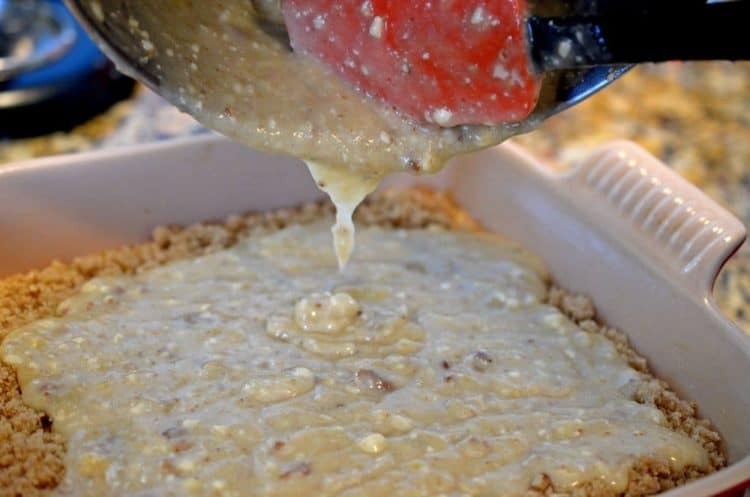 Add the remaining batter to the pan, and then the remaining crumble. Bake for 50-60 minutes, until tooth pick from center of cake is clean. Show me what you made on Instagram or Facebook and tag me at @plattertalk or hashtag it at #plattertalk. Subscribe now and get this Platter Talk ebook "Our Ultimate Top 10 Recipes". Hi Dan!! I loved this the first time I saw it. So happy you shared at The Weekend Social. FYI, by my choice, this is my final week as cohost of TWS. I hope you’ll stop by http://www.KitchenDreaming.com to link up Thursday 9:00 PM EST. Pinned. always looking for a way to use the numerous bananas I buy the gals that don’t get eaten. This looks perfect. ps – visiting from link-up! That’s a wonderful change of pace from banana bread. I have bananas on hand all the time too in all stages of ripeness. So I do not judge you. Ha. What a wonderful coffee cake. I could sure use a piece for breakfast this morning! What a delightful recipe for cake! There is nothing better than seeing a man bake a cakes. Love the recipe and the baker. Looks delicious – love a good crumble topping! This looks so good! Regular banana bread pales in comparison to this beauty. How clever to turn one of our favorite treats into a better treat! Loving this cake and the crumble really rocks it!! I love banana cake! This looks fabulous with the crumb! OK. I want this, and I want it now. I love banana cakes, and the crumb topping really puts this one over the top. Yum, and thanks! Happy New Year to you and yours! OH yea! Your banana crumble cake looks calorie worthy to me. I’ll take two pieces, please! Yep – the best things in life!! Scott, your cake looks and sounds delicious and I am truly looking forward to trying your recipe. My stomach is growling – I sure wish I had some of your cake to quiet the beast:-) Great job. This looks so good !!! I can dive into a piece as I am writing this. Anything with bananas in it is a winner! We wish you a blessed 2015! and, thank you for being such good friends this past year! I want to be at your counter eating a slice of this little bit of heaven on a plate! Wonderful post. Nothing better than sharing a tasty treat and discussing world events with the family! Looks great. Nothing more fun than both working the kitchen. Wow, this looks so good and I love pecans. Nice job guys. OMG guys…this cake looks sooooo good! And you know I don’t indulge in sweets very often, But I’m not sure I can refuse a piece of your scrumptious-looking cake! Oh my, I’m so jealous. I want a piece of that homemade goodness too! Tell the boys to save me a slice!! Thanks for stopping by Platter Talk where you'll find recipes that we make for ourselves and our six hungry boys. -Dan & Scott. Join our newsletter for free recipes, food stories, and inspiration. We're also giving away our ebook "Our Ultimate Top 10 Recipes" so signup today! We are an affiliate for Amazon Services LLC Associates Program. As such we earn a small fee by linking Amazon.com and affiliated sites. Free recipes straight to your inbox when you subscribe to the Platter Talk newsletter.